Hubby found some information on it several months ago and sent it my way. I was intrigued, but put it aside as my attention was elsewhere. Recently, I started looking at it again and my fascination has grown. Keyhole gardening began in Africa, where drought made growing food very challenging, if not impossible. The design is simple. 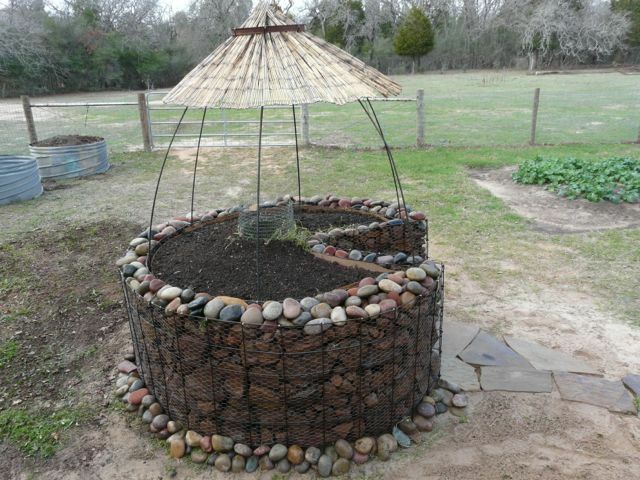 It is a raised-bed planter, typically built in the shape of a circle, about 6 ft in diameter and waist-high. A notch, similar to a slice of pie, is built into the design and a hole is in the center of the planter. From above, the planter would look like a keyhole. The exterior of the bed is built using rocks, concrete, metal, wood or any material that can withstand the weight of wet soil. Wire mesh is used to create a tube that is 1 ft in diameter and 4 ft high. This tube is placed in the hole in the middle of the bed. Inside the bed you then begin to layer cardboard around the outer walls, sticks/wood can be placed on the bottom and then covered with cardboard. Begin layering compostable materials making sure to wet these materials down as you go. 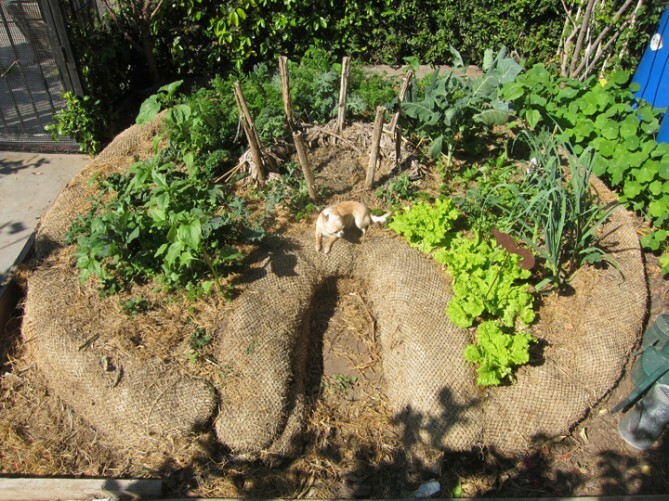 The last few inches on the top should be compost and/or soil and should slope from the wire mesh tube in the center of the bed to the outside edge of the bed. Now it’s time to begin layering compost into the wire mesh tube – kitchen scraps, lawn clippings, leaves, weeds, coffee grounds, tea bags, newspaper, cardboard, etc. 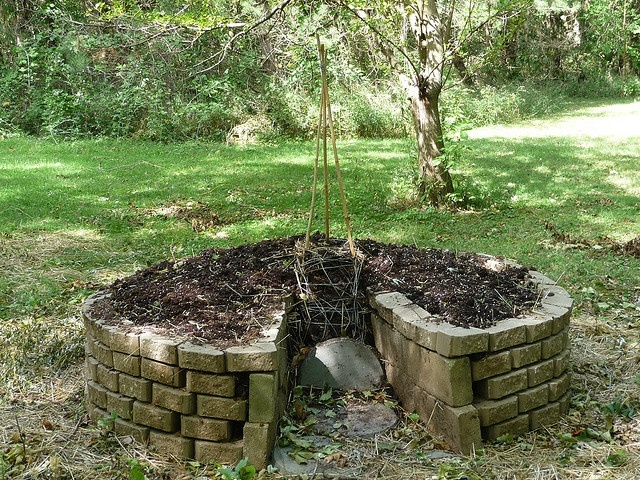 The compost will help keep the proper nutrients and moisture in the soil. When needed, water the compost. 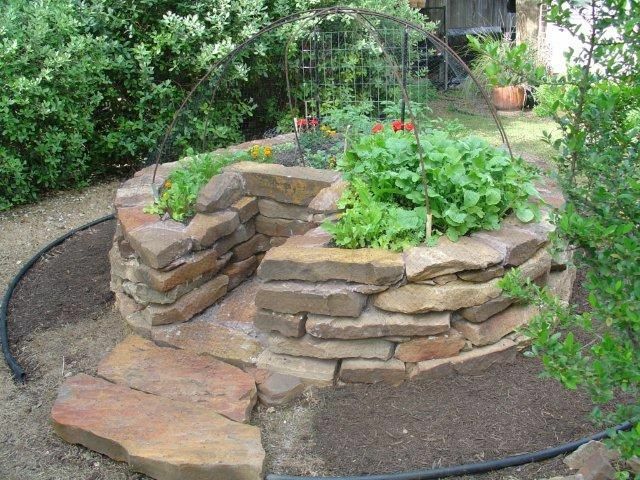 In areas where heat and drought are problematic, you may want to build an arch over the bed that will allow you to use a shade cloth to protect your plants from the sun’s heat. For those who want to extend their growing seasons, plastic sheeting over the arch will create a green house. Then it’s time to plant and watch the wonderful bounty that can be produced from keyhole gardening. Keyhole gardening is a great way to use recycled materials and I can definitely see this type of gardening in my future!!! Until my husband found information on keyhole gardening some months ago, I had never heard of it. It’s fantastic though. Being able to create and grow produce in areas that are typically arid is amazing. Not to mention the gardens can create some beautiful landscaping. I won’t be starting keyhole gardening where we currently live, but once we purchase our farm land, those keyholes will be built 🙂 And I’m taking my red wrigglers with me!